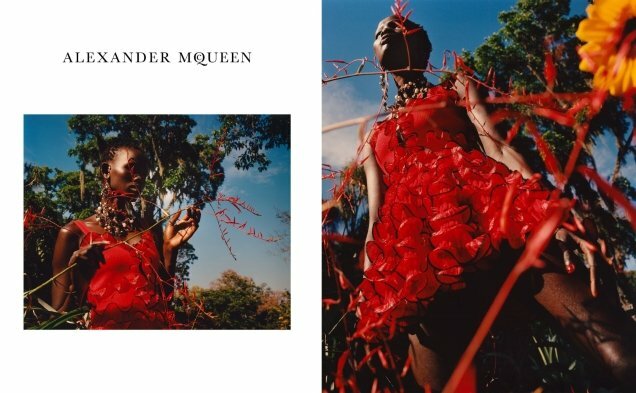 The majority of the Spring 2018 campaigns are now out, but nothing could have prepared us for the sheer brilliance of Alexander McQueen’s offering. Receiving a standing ovation from our forum members, creative director Sarah Burton replaces model Rianne van Rompaey with the beautiful Shanelle Nyasiase. Jamie Hawkesworth maintains his role as campaign photographer and transports us to the tropical climate of Brazil, shooting the striking campaign on location amongst the lush gardens of the Sítio Roberto Burle estate. TFS forum members couldn’t contain their excitement. “So regal and the location is perfect. I really like the lighting too. Look at those colors,” proclaimed simon at once. “Majestic! Everything works so perfectly together, the location, the stunning photography and of course Shanelle is such a gem. Not only the clothes look incredible against her skin but it’s also the way she wears them. Such grace,” declared Wolkfolk. “Very beautiful and refreshing,” Wintergreen added. Anlabe32 was quick to make her feelings clear. “The best this season. Just unbelievable rich, colorful and warm. Love everything about it,” she approved immediately. “Gorgeous. Everything, every shot, just perfection. The best McQueen campaign in the recent years, without a doubt,” applauded guimon. “This is regal. An unexpected cast and very refreshing. The colors are vibrant, the location is a dream. Beautiful campaign!” Valentine27 stated. “What a stunning campaign, definitely my favorite of the season,” echoed Lausanne. Be sure to check out the glorious campaign in full, and join the standing ovation here.